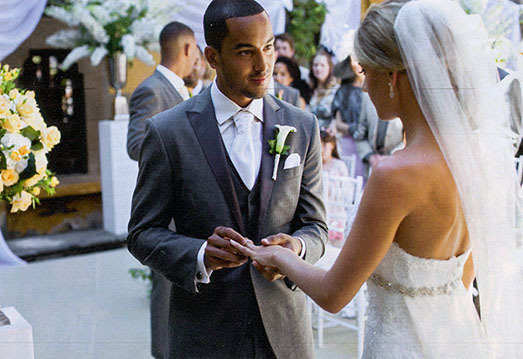 He may be the fastest footballer in the Premier League, but it took top goal-scoring Arsenal and England star Theo Walcott eight years to whisk his stunning sweetheart Melanie Slade off to the altar. But those who attended their magical Italian wedding on 15 June would all agree it was well worth the wait. The couple, who’ve been together since the tender age of 16, married in the romantic surroundings of Castello di Vincigliata, a beautiful 13th-century castle set in the lush, rolling Tuscan hills above Florence. As someone long fascinated by all things medieval, the setting could not have been more fitting for 24-year-old Theo. “Melanie first came to view the castle without me and she said to me afterwards,” “The minute you see it, you’ll fall in love with it,” the player told hello!, who were honoured to be invited to cover the celebrations. “And she was right”. In fact, so bowled over was he by the venue, he had a tattoo featuring the castle’s turrets etched onto his right arm in the run-up to his wedding, as a permanent reminder of what would prove to be the most moving and memorable day of his life. “Everyone has been so happy and excited for us, though not as excited as me and Mel,” said Theo, just ahead of their big day. Melanie and Theo. both 24. chose romantic Castello di Vincigliata in Tuscany for their nuptials. The colours of the day, white and peach, are reflected in the brides bouquet of calla lilies, the Bridesmaids roses and the groom’s buttonhole. In their draped gowns of soft peach, the bridesmaids make the final adjustments to Melanie’s customised Suzanne Neville dress. On her wrist, the bride wears an exquisite diamond bracelet – a wedding day surprise from Theo – which complements her glittering Aruna Seth heels. Melanie shows off her stunning, slender figure as she twirls her train. She had tried on many bridal gowns ahead of her big day, but says she knew the minute she slipped on the full-length ivory Suzanne Neville gown that it was the perfect choice for her Italian celebration, where the wedding party leads the guests in showering the bride and groom with rose petals, which had been handed out in baskets at the end of the ceremony. The groom revealed that he had spent a relaxed morning, chilling out with his bestmen and enjoying a glass of celebratory champagne – though he admitted the nerves had kicked in a little as he’d got into his wedding car. “I started to feel a bit jittery” then, “but I’m fine now – I think,” he smiled. Soon, it was time for everyone to make their way down to the central courtyard, which, thanks to the creativity of wedding planner Collection 26, had been transformed into a chic and contemporary ceremony area that was only enhanced by the castle’s rustic beauty. 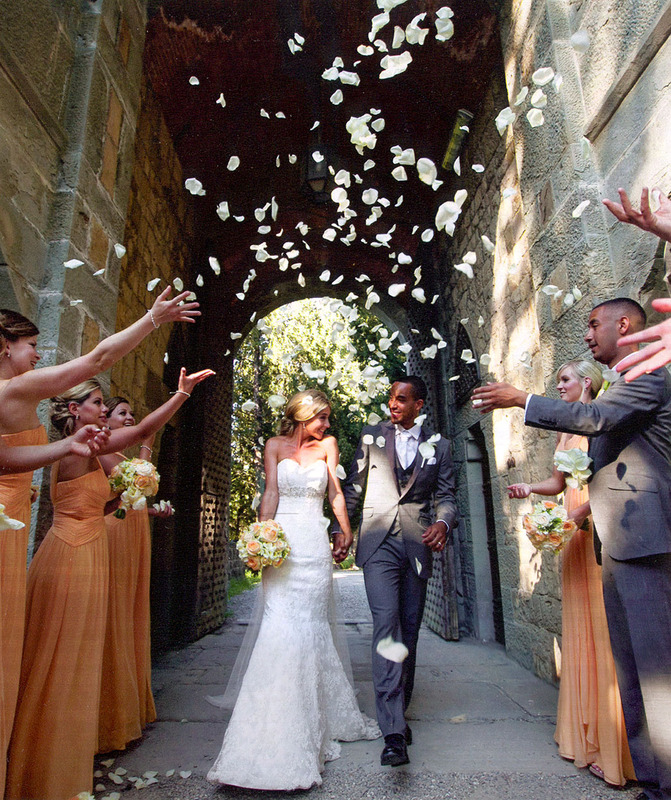 White chiffon drapes fluttered in the light Tuscan breeze and beautiful flower arrangements comprising delphiniums, cream and peach roses and hydrangeas perfectly complemented the castle’s fragrant orange trees and jasmine bushes. At shortly after 3pm, the man of the day’s big match arrived, flanked by his three best men – Jake Thomson, a close friend since he and Theo played football together for Southampton’s youth team, Nick King, the groom’s cousin, and Ashley, Theo’s brother, who’s been living in Los Angeles and had to endure an epic two-day trek to get there, due to delays and missed connecting flights. “I haven’t been able to sleep at all because I’ve been so stressed about making it,” he confided to us. “But nothing was going to keep me away, not today.” To top it all, Ashley had lost his voice. “I’m just hoping it will be better by the time we do the speeches,” he whispered. The opening bars of a sublime acoustic version of the song Turning Page, performed by young American newcomer Ciara Catalla, who Melanie had discovered on YouTube, heralded the arrival of the bridal party. Making their way towards the altar, the bridesmaids – Sarah and Emma Slade, the bride’s sisters, maid of honour Laura Lewis, Melanie’s best friend from her home town of Southampton, and close chums Sam Hills and Hayley Rampton, were stunning in long, soft peach draped gowns by dressmaker Olivia McLaren. Members of London-based showband Gilev performed an acoustic version of Aaliyah’s One in a Million as the couple signed the register, and as Theo leant over, his hips started swaying to the music. Many of the guests had been moved to tears during the service, but none more so than Theo’s sister Hollie. She had been due to give a reading and had chosen a children’s tale called A Lovely Love Story by Edward Monkton. “I’m five years older than Theo and when we were small I would read him stories, so I really wanted to read my little brother a story on his wedding day,” she explained to us. Unfortunately, she was so overcome with emotion that she was unable to do the reading. Instead, Ashley and Theo’s father Don stepped in. Exiting the ceremony to Joss Stone’s L-O-V-E, the bride and groom disappeared inside the castle for a few minutes to gather their thoughts. For the dinner in the castle?s courtyards, thousands of twinkling candles soften the building?s severe outlines. Each table is named after the word for “love” in a different language – in this case, in Turkish. With the prosecco freely flowing, Theo toasts his beautiful bride, before the couple cut the cake – a four tiered affair including layers of rich Belgian chocolate and coconut and lime sponge. “It seems strange to be welcoming Theo into our family because he has been such a big part of it for eight years, but I couldn’t be more proud” Father of the bride John. “I knew from very early in our relationship that Melanie was the only girl for me, but I think it was the World Cup in 2006 that really brought that home to me,” the groom told us. Then just 17, Theo found himself in the national spotlight when he was included in England?s World Cup squad in Germany – even though he did not eventually get to play. They watched the famous New Year’s Eve firework display from their balcony and, as it drew to a close, Theo asked Melanie what her first words of the New Year were. “I love you,” she said. At that, Theo replied: “I love you too,” got down on one knee and asked her to marry him. He presented her with a gorgeous diamond ring from Bonhams, which she’d fallen in love with after Theo had arranged for a friend to take an unsuspecting Melanie “window shopping”. Just shy of 18 months later and the surprises kept coming for his bride on their wedding day. First, Theo sent her an exquisite diamond bracelet on the morning of their big day. She, in turn, gave him a watch, engraved with the words “Don’t Be Late” and the date of their wedding. As for gifts from guests, the couple asked everyone not to buy them anything but instead to make a donation to one or both of two charities that are close to their hearts – Macmillan Cancer Support and the Willow Foundation. Melanie had come into contact with Macmillan after her older sister Sarah battled kidney cancer. “They offer support throughout and it’s such an amazing charity,” said Melanie. Theo is an ambassador for the Willow Foundation, which was set up by Arsenal legend Bob Wilson and his wife Megs in 1999 in memory of their daughter Anna, who died of cancer at the age of 31. “The foundation organises special days for young adults who are suffering from serious illnesses and I feel privileged to be associated with it,” said Theo. But groom Theo did have one very special present for his bride. Knowing how much she had loved the fireworks in London on the night he proposed, he recreated the display for her on their wedding night, complete with the same soundtrack that had been played. There were gasps of delight and cheers from the guests as a kaleidoscope of colour exploded into the night sky.